In a small pot, add 1/2 cup of apple cider vinegar, 1/3 cup of olive oil, 1/3 cup of sugar, 1 tablespoon of salt and 1/2 tablespoon of garlic powder. Bring to boil and keep stirring until the sugar completely dissolves. In a bowl, add coleslaw mix and chopped onions. Pour the hot dressing over the coleslaw and chopped onions. Stir. 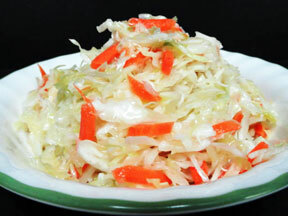 Let the coleslaw sit for 2 hours, stirring occasionally while it marinates. Once the coleslaw has marinated you can drain the liquid from the coleslaw. Refrigerate until ready to serve.